For young kids, light is simply something that is there or is not. There is not intuitive sense that light travels since it travels so fast. 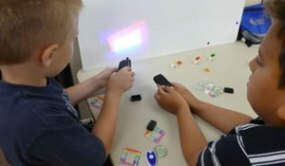 This hands on STEM activity introduces elementary students to the fact that light travels in straight line and spreads out as it gets further away from the source.